In a room full of bright-colored cubes and giant mattresses, giggling children climb bars, try somersaults and walk gingerly on a low balance beam. Some stand on their hands, showing off their bellies under the guidance of four coaches. It was pure fun for 8-year-old Lucy Huang, a chubby-cheeked, cheerful and talkative girl. Her parents have modest goals for her progress: they hope the lessons help her stay fit, improve her balance, and help brain development. "I love it here because there's lots of fun. I love doing flips forward and backward, and I like the rings," she said in one breath while sitting on the balance beam, her legs dangling. 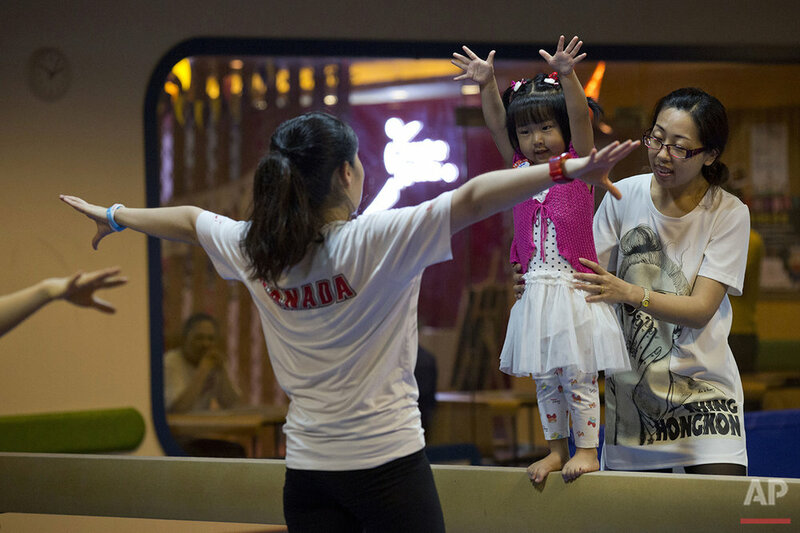 The scene in downtown Shanghai might be common in western countries but is a rare sight in China, where parents have eschewed gymnastics lessons for their children. The mere mention of gymnastics usually evokes stereotypical, decades-old images of little boys and girls tearfully practicing splits, living away from home under the watch of strict coaches, all for the chance at an Olympic gold. This summer, Chinese athletes that primarily grew up in the decades-old state sports system are still expected to dazzle the world and scoop up dozens of medals when the Summer Games open in Rio de Janeiro. But at home there are strong efforts to reform the state-led system, which is struggling to recruit the next generation of stars despite its glorious records of churning out hundreds of Olympic gold medalists and world champions. "The current system is to rally national resources to train a few to win the Olympic golds and win honors for the country," said Xiong Xiaozheng, a retired sports professor in Beijing. "But this strategy no longer works with today's society, and is losing its advantages." Without change, China's spot among the world's elite in sports is in danger. Established in the 1950s, China's state-led sports training system was tasked with rallying national pride. The poor, communist country was in need of international accolades, and bringing potential stars into one place was a cost-efficient way to train athletes. "When the country did not have the resources to popularize any sport, when families were still struggling to feed themselves, the only way to train top athletes was to pool all the resources the country had then," said Ye Zhennan, who will travel to Rio as manager for China's national gymnastics team. For a long time, it worked. The system pushed China into top place in the gold medal hunt, peaking in the 2008 Beijing Olympics with 51 golds. Four years later, China grabbed 38 golds in London, trailing only behind the sports powerhouse United States. In the system, local governments scout out potential talent at very young ages, often in pre-school. The children are separated from their families but corralled in state sports schools — overseen by sports authorities rather than education officials— to go through strict training programs for the sole purpose of winning world titles or Olympic golds. The young athletes must go through rounds of elimination as they advance to the city team, the provincial team and eventually the national team. They must reach the top of the podium at the Olympics, or are considered failures. "The path is extremely narrow," recalled Cheng Liang, a former national all-around champion in artistic gymnastics. Because of injuries, he dropped out before the 1996 Atlanta Games. Less than one percent of athletes reach the apex and are generously rewarded with fame and cash. They become household names, or even national heroes, with glowing reports published in state media. Those who fall off the path often find themselves tossed back into a bewildering society with inadequate academic preparations or social skills. "Training is always the top priority, instead of school," Cheng said. Chinese families, especially poor rural households, were willing to send their children to the all-expenses-paid sports schools, and young athletes eliminated usually were able to find jobs in a state-planned economy. But after decades of rapid growth, China has become the world's second largest economy. Its people have much fatter wallets and far more life choices for themselves and their children. Sports schools, and their slim shot at success, are not as alluring. Add to that allegations that China has used underage gymnasts — they were ordered to return a bronze medal won in the Sydney Games — and parents decide to opt out. "Parents these days want their children to enjoy a normal life," Cheng said. It is a far fetch to think Lucy, the giggly girl in the Shanghai gym, and her playmates may one day compete for China on a world stage. Yet the reason she can learn gymnastics at all is a reflection of changes that have made the sport recreation, instead of a career choice. Criticism of the state system has grown louder in the past decade, as members of the Chinese public are increasingly rebelling against the notoriously ruthless, rigid training regimes, exploitation of young athletes, and proclivity for dishonest practices such as game rigging. Taking cues from gymnastics powerhouses such as the United States and Japan, Chinese sports officials believe the answer lies with popularizing sports. Already, Beijing has ordered the country's football association to be divested from the government and has issued policies to promote the sport on school campuses. The country has commercialized football and basketball through leagues, with varying degrees of success. Road running and swimming are also beginning to take root among the public and are especially popular with members of China's growing middle class. Gymnastics is a bigger challenge. Chinese officials must popularize the sport after decades of keeping it from the public, reserved only for a chosen few. "In the public eye, gymnastics is an elite sport. How can you popularize a sport that is widely considered to be extremely difficult, tiring and dangerous?" said Wang Tongjie, director of gymnastics at China's General Administration of Sport. There are only 7,000 registered Chinese gymnasts, Wang said. The United States — with a population only one-fourth of China's — has nearly 150,000 competing gymnasts at all levels. There is a huge gap in talent between China's national team and the feeder teams at the provincial level, said Ye. The national team taps the country's best to come up with 10 top gymnasts, a number small enough to achieve, for the Olympics, he said. Team China is covered for now. The future is not so certain. "What we have is about to become broken, but the new system is yet to be established," Ye said. He points to a former powerhouse that failed to qualify for Rio as a team this year as a tale of caution. "If we don't change, we will be like Romania." His Olympic fortunes faded, and Cheng, the former national champion, moved to Alberta, Canada, in 1998 to work for a gym club. There, he was taken aback by what he saw: Kids of all sizes, some fat and slow, all learning skills. Gymnastics did not have to be an elite sport at all. "I saw everybody doing gymnastics, and I realized this is a sport for everybody. It's a fundamental sport," Cheng said. Sensing the changes in China, Cheng started to look for opportunities after the 2008 Beijing Olympics. 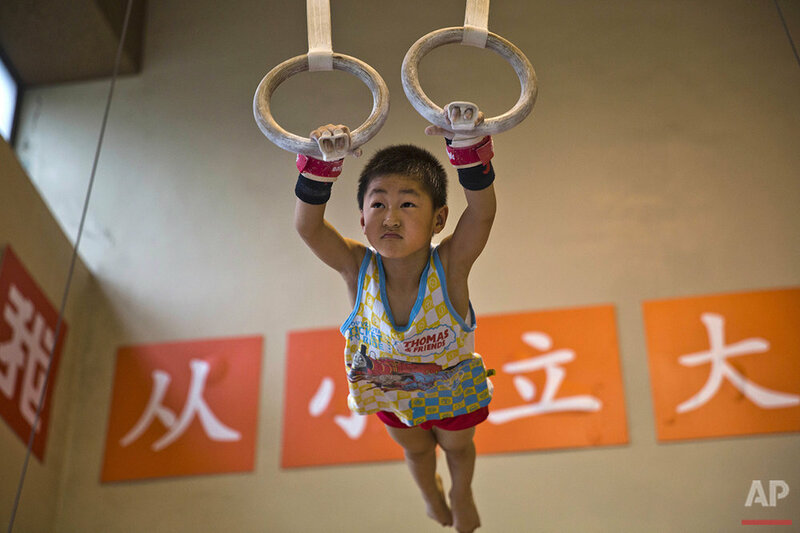 By 2012, Cheng set up China's first private gym club in the eastern city of Changzhou, catering to toddlers and children. He and his brother opened two more in Shanghai in late 2015 and signed up 300 members within six months. Annual membership costs more than $2,000, but local families with decent incomes see the membership as a good investment in their children. "In our education system, sports are not very important, and there are few opportunities for kids to play, unless they opt for a training career," said Yu Zhiqiang, a fund manager whose 9-year-old daughter Amanda is taking lessons with Cheng's gym club. "I would like to have her to have fun with gymnastics," her father said. "If she's truly talented and is willing (to take on a professional career), we will support her." Four years after Cheng's gym opened, there are now 35 private gyms across China, and they have the support from the country's sports administration, said Wang, from China's General Administration of Sport. She is also pushing to introduce gymnastics to more kindergartens and grade schools across China. Reforms at state sports schools are also under discussion. Wang said the plan is to gradually turn state sports schools over to education authorities, so the young athletes will no longer only focus on sports. They will instead become students that must meet the same expectations as their peers. "We have to change the public opinion of the sport, and we've found it necessary to put the word 'happy' before gymnastics," Wang said. "The word 'happy' may be superfluous in western countries to describe this sport, but if we don't do so, the public won't even give it a try but turn away at the mention of gymnastics." If the reforms are successful, the path toward Olympic gold will still be paved with sweat, rigor and sacrifice. But there will be a difference. "By then, we will have athletes who really want to do it themselves and who can truly experience the joy of the sport, instead of those in the past who went into the field because the country asked them to do it," Wang said. Text from the AP news story, In China, 'Happy Gymnastics' replaces grind of strict study by Didi Tang.